3G synthetic grass 5-a-side court construction is popular in the UK because the artificial turf specification is ideal for all weather facilities. A primary school in London approached us this year to install one of these 3G surfaces so that their students could use it during PE lessons and in extra curricular clubs. The school wanted to replace a natural grass pitch which could not be used for sports by installing a brand new top quality synthetic surface. 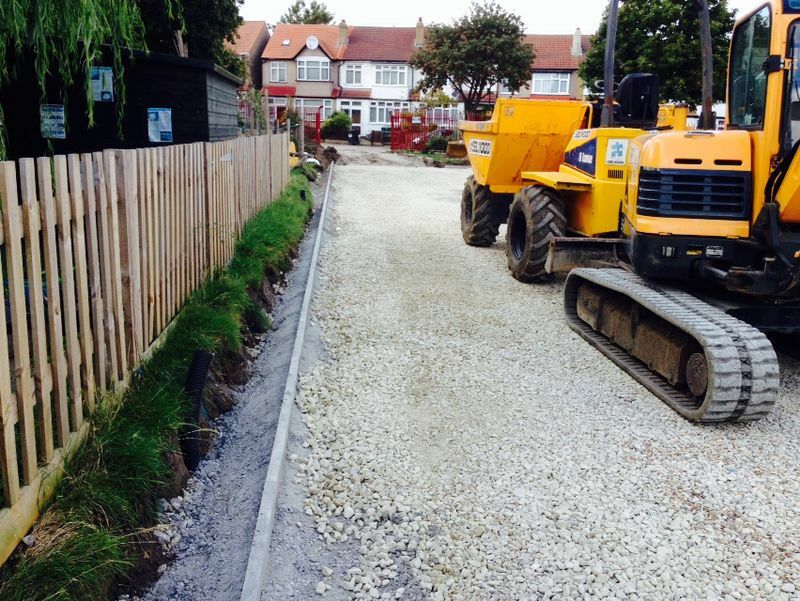 We started this project by preparing the groundworks which involved digging out the existing natural grass surface and putting in a soakaway system. This system helps the pitch to have an efficient drainage system for rainwater so that the area doesn’t become flooded in wet weather. We then put in a layer of porous stones which we typically use as a sub base for all of our sports pitch installations because it’s the most durable and long lasting. 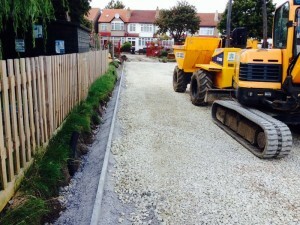 Once the stone had been installed and compacted, it created the ideal foundation for the rest of the 3G surfacing and the 5-a-side court construction. With the compacted porous stone sub base as a strong foundation, we could then apply a macadam base layer which creates a smooth and even surface for the 3G synthetic carpet to be installed. This next part was done by rolling out the artificial sports turf in pieces which were then glued together to hold them in place. Finally the artificial carpet was infilled with sand and rubber, this gives the sport surfacing ideal performance qualities and gives players a more comfortable playing experience. When we had completed the synthetic 5-a-side court construction, the school were very pleased with their new all weather sports facility. 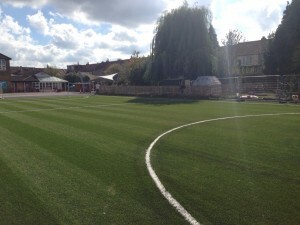 The 3G artificial pitch can be used during lessons and in after school sports activities. Because of the strong durability of this surface type, the school even have the opportunity to rent the pitch out to others, enabling them to get some extra revenue. As we are a specialist company in the installation of outdoor sports facilities like artificial pitches and multi use games areas, we have installed many of these surfaces throughout the UK. Our services include 5-a-side court construction, tennis court installation, building athletics facilities, as well as maintenance for all of these outdoor sports surfaces. We could install a 5-a-side football pitch like this one in London for your school, college or sports clubs. You can find out more about all of our services and the sports facilities we specialise in by visiting our website on www.sportsandsafetysurfaces.co.uk which has plenty of case studies and product information. To discuss a 5-a-side court construction or any other project, fill in our contact form with the details and we’ll be in touch to give you some product examples and a price quotation for the works. We always aim to offer our clients the best quality products at great value prices and we can even help you cut costs to stick within a specific budget. Don’t hesitate to put a comment in the box below if you’ve got any questions about this 5-a-side court construction, and share this post if you thought it was interesting! I am a social media marketer and blogger at Soft Surfaces Ltd in Wilmslow, Cheshire. I love writing articles and posting content on the major social media platforms, so don’t hesitate to follow me! Becca Honeybill – who has written 64 posts on Sports and Safety Surfaces. Call: 01625 445 760 or email below. Please enter all the required fields.